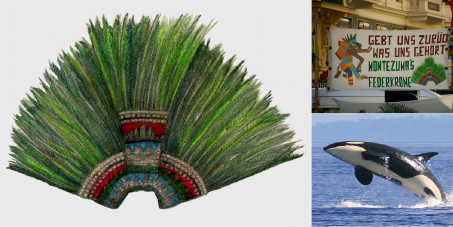 GIVE MEXICO BACK WHAT IT BELONG TO - THE MEXICAN EMPEROR MONTEZUMA'S HOLY FEATHER-CROWN!!! This petition has been created by Xokonoschtletl G. and may not represent the views of the Avaaz community. The sacred crown of the Emperor Montezuma is the only one that remains around the world! It consists of exactly 400 Quetzal bird feathers, which were sacred to the Aztecs and Mayans along with others. It is studded with gold leaf, symbolizing the sun, which were originally numbered and allowed cosmic calculations. After the murder of Montezuma in 1520, the crown was sent to the Spanish King in Madrid – Spain. From there was sent to Innsbruck in Austria, to the Hapsburg family. But the King Charles V of Spain was NOT Spaniard...he was born in Belgium. He belongs to the Hapsburg family. Then, he was also Emperor of Hungary, Belgium, Germany and Austria. The crown is currently held today by the Museum of Ethnology in Vienna, Austria. They said and assume that OUR crown of feathers was “legally” acquired in 1596. WITH OUT BEEN ABLE TO PROVE IT AT ANYTIME!!! The acquisition of stolen goods is legally punishable around the world! At the Vienna Parliament are open NOW (October 2013) officially 3 points according to two Austrian political parties: the SPÖ ( Social Democrats ) and the Grünen ( the Green Partie). a) For a LOAN (11.05.2005 ), b) To GIVE it back as a gift (07.03.2007), c) Return it back to Mexico indefinitely (11.03.2009). At the parliament in Vienna, Austria OFFICIALLY parliamentarians have talked about returning the crown to Mexico about 20 times! Even the last Austrian President Thomas Klestil told to Austrian TV ( 2006 ): "I would not only want to return the feather crown of Montezuma to Mexico, I would personally take it there." However, even though the crown was in 2006 to more than 90 % chances of returning to Mexico. MEXICAN government has never officially asked for the crown to be returned to Mexico!!! The year 2012 the Austrians said that "the crown lend to Mexico for some time without saying a date or year, however in the opinion of a person from Vienna Technical University (TU ) the same 2012, said that a BIG container would be needed to transport the crown, which would require an airplane 350 METERS long! ... and since such a transporter doesn't exist, it could not be transported. "Remember the orca whale "Keiko" 5 tons of weight of the movie "Free Willy" was transported from Mexico to the city of Oregon in the USA by building a special plane named Hercules to be transported alive in a tank that had tons of ice and water. The whale was transfered to Iceland also. The orca whale was transported by air 4 times!!! So logically it WOULD BE VERY EASY to make a special case (specially since we have very advanced technology now in days) in order that it has no movement that could damage it. The crown is valued at 50 million US Dollars! The opinion of this individual from the Vienna University of Technology is trying to make it impossible for us! An evasive action to avoid having to face the moral responsibility and the need to escape criticism WORLD WIDE! "It was mentioned that the Spanish used ferocious and vicious war dogs trained to kill Indians and dismembered them. All those who are true Christians had many Indians in chains on their way to burned them in fire pits. They would kill them and had public slaughter of human flesh and said to one another: "Give me one so I can feed my dog, or give me a quarter of one of those creatures of children for my animals. There were others who spent the morning with their dogs to hunt, and when they returned, they were asked what had happened? They replied, "It was nice because my dogs have killed about 20 Indians. Murdered entire towns and cities, and not one was left alive. Though it was in the nature of the Indian people always receive with joy and gifts. Thousands and thousands of people were put in chains to carry things for the Spanish people. 6000 Aztecs were once with them, but only 4 returned, everyone else died along the way. Chains placed around their neck, and when several of them would suffer from hunger and hardship and began to get sick and tired , the Spanish did not remove the chains, but they cut off the head with their sword, allowing the head to fall to one side and the body on the other side. During their dances when they were unarmed, they where attacked with the words “Santiago to them” and with their spears they would destroy the innocents naked body. They Killed and much blood flowed so that no one remained alive. They did the same in many other places. The land in those places seemed like a real paradise and more inhabited than anywhere else in the world. Now everything is destroyed and abandoned, and no matter how tough you are, suffering persists to the core of the body to see everything. They cut thousands of indigenous ears, noses and throats, mostly for no reason at all. If the Indians do not do what their told… the Spaniards would kill them, and often there would be piles of heads found. I certify that to this day since the discovery of India never and in no single occasion have the Indians have done anything wrong to the Christians, it was us the first to robbed, abused, and cheated on all those Indian. The Indians were all lied to. But the Indian on the contrary, they liked to welcome the Spaniards, until those showed up with their deeds, what they want and who they are." It´s not possible that the country of AUSTRIA would be accomplices of the murderers and criminals of that time! It's completely irrelevant who "owns" our holy crown! After nearly 500 years in exile has finally come the time to return the crown to Mexico, the ORIGINAL place where it belongs! As an act of humanity and as a symbolic reparation for the genocide of indigenous peoples all over the continent of AMERICA, return our identity, Dignity and Pride! We must take back what is ours by heritage: Montezuma's crown! PLEASE, HELP US TO ACHIEVE OUR DREAM!! !